NTT Communications announced today that it has established the basic operations, administration and maintenance (OAM) function, a key technology for software-defined networking (SDN) on multiple wide area networks (WAN). 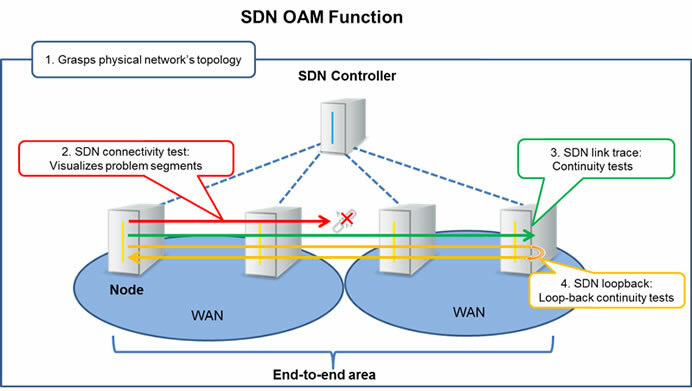 The new SDN OAM functions enable end-to-end network connection quality to be visualized on multiple WAN using link trace and loopback tests. NTT Com expects its new technology to make SDN operation and maintenance on WAN more efficient. NTT Com is now working to commercialize the technology for various environments involving SDN, including big data processing, high-quality broadcasting networks, enterprise global intranets and more. The new technology visualizes network topology by automatically collecting connection information on physical networks configuring SDN. It enables SDN operation and maintenance personnel to remotely monitor circuits and isolate problems and test circuits more accurately by verifying network connection quality and normality of link trace in end-to-end areas, even in WAN.